Just for fun, today I’d thought I’d give you a sneak peek of my upcoming bookStructuring Your Novel: Essential Keys for Writing an Outstanding Story. The book, available September 1, 2013, x-rays our notion of storycraft to get past the outer aesthetics right on down to the muscular and skeletal systems that make our books work. Once we grasp the mechanics of structure, we’re able to take so much of the guesswork out of crafting a strong story from start to finish. Today, I’d like to share an excerpt from Chapter 2, which talks about one of the trickiest questions any author is faced with: Where to begin the story? 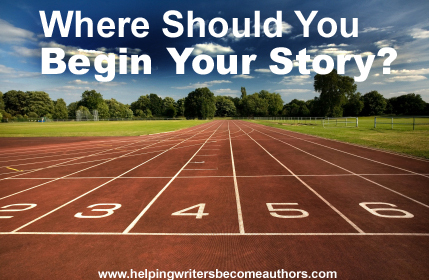 Authors are much more likely to begin their stories too soon, rather too late. We feel the pressure of making sure readers are well-informed. They have to understand what’s going on to care about it, right? To some extent, yes, of course they do. But the problem with all this info right at the beginning is that it distracts from what readers find most interesting: the character reacting to his current plight. What is the first dramatic event? The question you need to ask yourself is, “What is the first dramatic event in the plot?” Finding this event will help you figure out the first domino in your story’s line of dominoes. In some stories that first domino can take place years before the story proper and therefore will be better told as a part of the backstory. But, nine times out of ten, this will be your best choice for a beginning scene. What is your first major plot point? Another thing to keep in mind is the placement of your First Plot Point, which should occur around the 25% mark (we’ll discuss this in more depth in Chapter 6). If you begin your story too soon or too late, you’ll jar the balance of your book and force your major plot points at the 25%, 50%, and 75% marks off schedule. Consider your First Plot Point, which will be the first major turning point for your characters and, as a result, often the Inciting or Key Event (which we’ll also discuss in Chapter 6). The setup that occurs prior to these scenes should take no more than a quarter of the book. Anymore than that and you’ll know you’ve begun your story too early and need to do some cutting. What are the three essentials? The most important thing to keep in mind is the most obvious: No deadweight. The beginning doesn’t have to be race-’em-chase-’em, particularly since you need to take the time to introduce and set up characters. But it does have to be tight. Otherwise, your readers are gone. How do you grip readers with can’t-look-away action, while still taking the time to establish character? How do you decide upon the perfect moment to open the scene? How do you balance just the right amount of information to keep from confusing readers, while at same time raising the kind of intriguing questions that make them want to read on? When we come down to it, there are only three integral components necessary to create a successful opening: character, action, and setting. Scheier’s professor not only made a sturdy case for the active voice, he also offered a powerful beginning. Let’s take a closer look. This entry was posted in Publishing and tagged author, beginning, novel, plot points, story, wordplay, writer on July 12, 2013 by First Edition Design Publishing.